More than 7,500 cities are represented by runners in the 2018 Boston Marathon, but 50 cities account for about 4,600 runners, or 15% of all entrants. 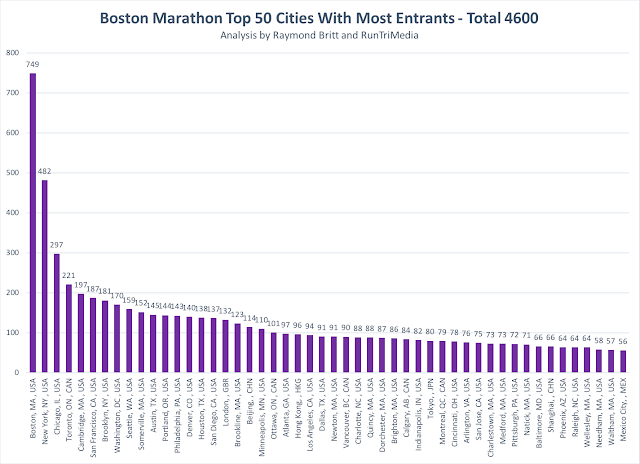 Boston, New York City, Chicago, Ontario and Cambridge are the top 5 cities with the most entrants. London, Beijing, Hong Kong and Tokyo rank generally in the middle of the Top 50.